The object that a black man pulled from his pant pocket before being fatally shot by police in Southern California Tuesday afternoon was not a deadly weapon -- but a vape smoking device, the El Cajon Police Department said Wednesday evening. The Medical Examiner's Office also identified the man as Alfred Okwera Olango, 38, of El Cajon. 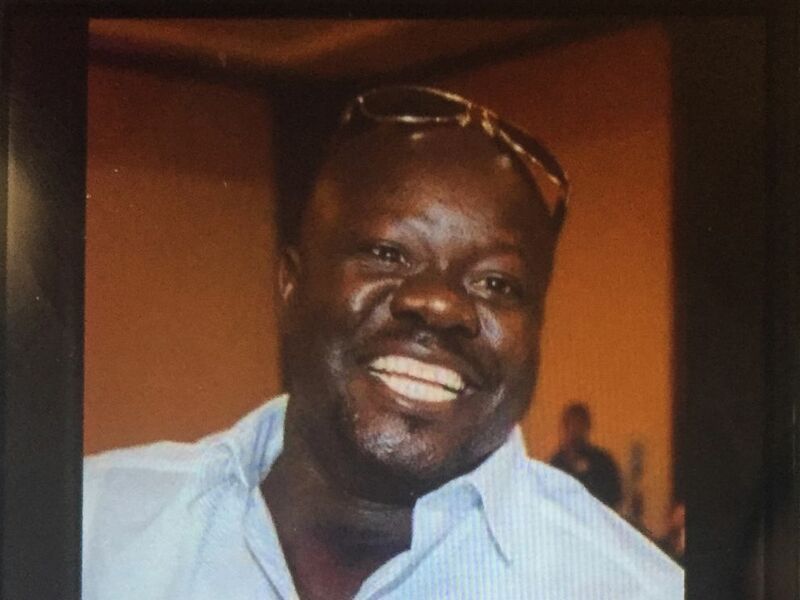 This undated cellphone photo released by Dan Gilleon, the attorney for the family of Alfred Olango, shows Alfred Olango, the Ugandan refugee killed Tuesday, Sept. 27, 2016, in El Cajon, Calif. 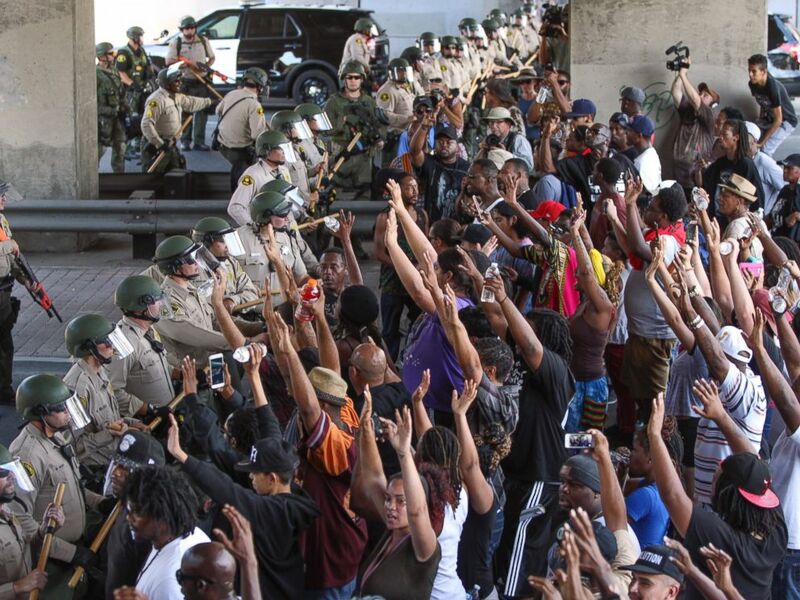 Protests erupted in El Cajon -- located about 16 miles northeast of San Diego -- following the shooting, and continued into Wednesday evening. 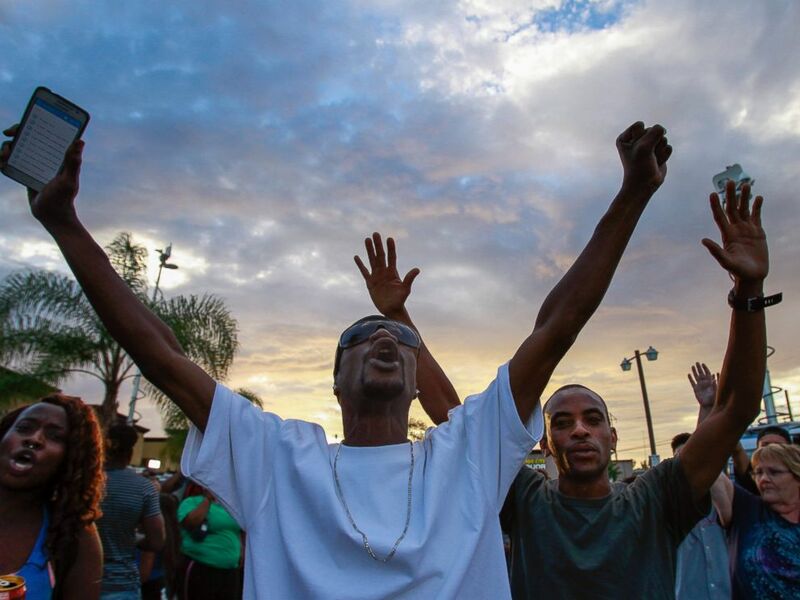 Police form a line in front of protesters, Wednesday, Sept. 28, 2016, in El Cajon, Calif.
People hold signs during a protest in front of the El Cajon Police Department Wednesday, Sept. 28, 2016, in El Cajon, Calif.
Police initially said Tuesday that it received a 911 call from the man's sister, saying her brother was "not acting like himself." According to the caller, he was walking in traffic, endangering himself and motorists, police said. Two officers located the man, who was described as an African-American in his 30s, behind a restaurant in the city, some 16 miles northeast of San Diego. Olango refused multiple instructions to remove his hand from his pocket, which caused one officer to draw his firearm, police said. Olango continued to ignore further commands and paced back and forth while officers tried talking to him, according to police. At one point, Olango "rapidly drew an object from his front pants pocket, placed both hands together and extended them rapidly toward the officer, taking up what appeared to be a shooting stance," police said Tuesday. That's when one officer deployed his Taser and another fired his gun several times, striking Olango, according to police. In Wednesday's statement announcing that the item was a vape smoking device, police said, "The vape has an all silver cylinder (Smok TFV4 MINI) that is approximately 1" diameter and 3" long that was pointed toward the officer. The box of the vape that was held in his grip, is 4” x 2 1/4”s x 1” (Pioneer for You Vape). The vape was collected as evidence from the scene." Olango was transported to a local hospital, where he was pronounced dead, according to police. El Cajon Mayor Bill Wells said in a press conference Tuesday afternoon that he had watched the video and "saw a man who was distraught" and in pain. The mayor said Olango's sister indicated in the 911 call that he had a mental illness, adding that all officers in the El Cajon Police Department receive psychiatric training. "There have been several questions about the Psychiatric Emergency Response Team (PERT)," police said in Wednesday's statement. "The El Cajon Police Department does have an agreement with Community Research Foundation/PERT which allows certified licensed clinicians to partner with police officers in the field in order to provide direct support for mental health calls. On 9/27/16, during the hours of this incident, there was a PERT clinician with a police officer. At the specific time of this incident, that team was on a different radio call that was also PERT related. They were not immediately available." The district attorney's office has the video of the shooting and will release it if they see fit, Wells said. 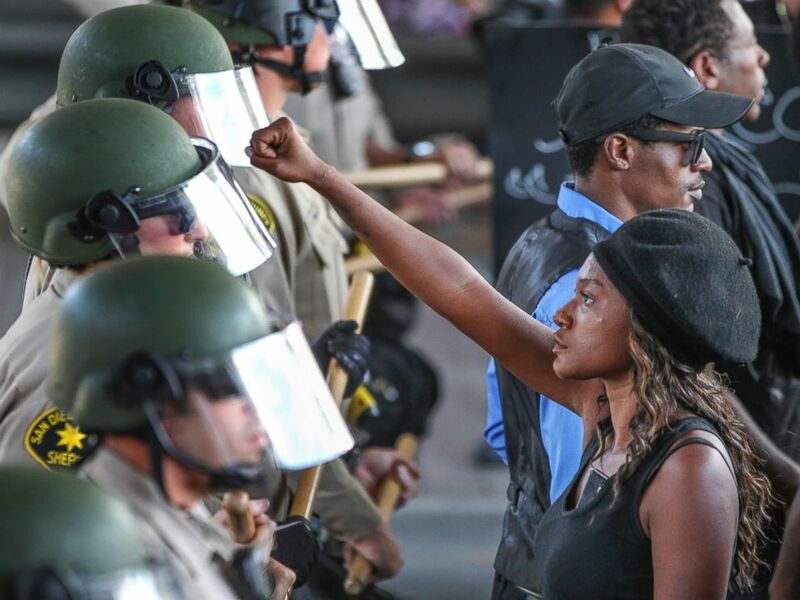 Ebonay Lee holds up her fist toward a line of Sheriff's deputies as she and other people protest Wednesday, Sept. 28, 2016, in El Cajon, Calif.
People protest at the scene where a black man was shot by police earlier in El Cajon, east of San Diego, Calif., Sept. 27, 2016. The aftermath of the shooting was recorded via Facebook Live. In the video, which lasts for more than 25 minutes, an unidentified woman who claims to be a witness is seen speaking with police about what she says she saw. "When he took his hand out, he did have something in his hand, but it was no gun. And that's when they shot him," she told the officers. The Facebook Live video also shows a distraught woman who says she is the victim's sister and is crying to officers at the scene. "Oh, my God, you killed my brother!" the woman yells through tears. "I called you guys to come help, and you killed my brother. "I told you, he's sick," she continues. "Why didn't you Tase him? Why, why, why, why?" Police said a witness voluntarily provided a video of the incident on a cellphone, the only phone provided to officers in the investigation. The video has not yet been released. Investigators are reviewing the cellphone video and other recordings recovered from the scene — which police say support their version of events. El Cajon Police Chief Jeff Davis has vowed that there will be a thorough investigation. "This will be transparent," he said at a news conference late Tuesday night. "This will be looked at by multiple sets of eyes, and not just ours." Since Tuesday, dozens of protesters have gathered at the scene of the shooting, chanting, "Black lives matter" and "Hands up, don't shoot!" 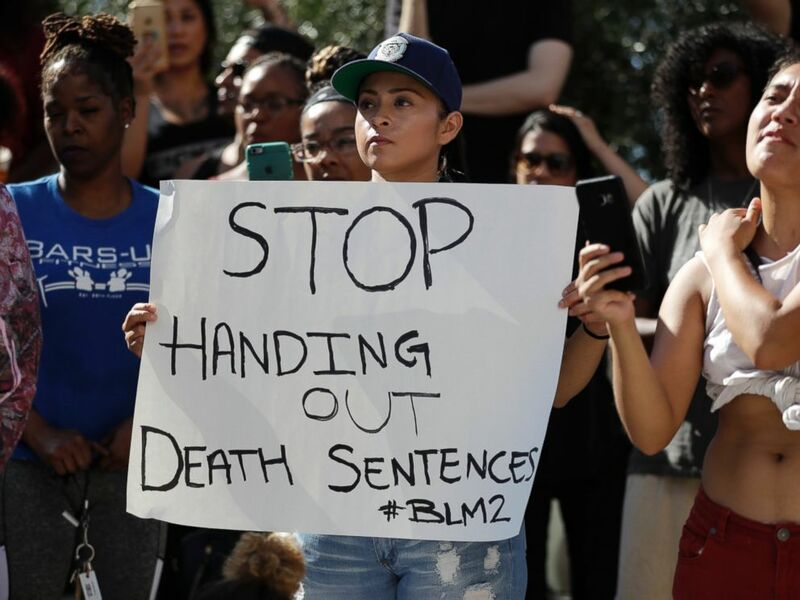 The incident is the latest in a string of officer-involved shootings of black men this month that have sparked protests. On Sept. 20, police in Charlotte, North Carolina, fatally shot 43-year-old Keith Lamont Scott, who investigators said was holding a handgun. On Sept. 16, police in Tulsa, Oklahoma, shot and killed 40-year-old Terence Crutcher, who was unarmed. The officer who shot Crutcher has been charged in his death and will make her first court appearance on Friday.